The report details claims children are dragged from their beds, bound and blindfolded. 1. 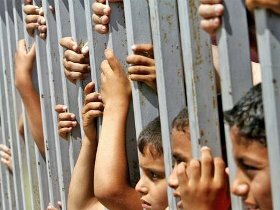 No Palestinian child should ever be abducted/imprisoned/interrogated/tortured by agents of the Zionist entity. If it is thought they have done wrong (as when my wallet was stolen in Hebron) they should be dealt with by Palestinian officials. 2. What has the FCO been doing these past years?